If you’ve wanted to find a job where you can work from home with Google, apply to join their team as a Field Service Representative may be a great option for you and your career goals. If working for Google sounds like a good fit for you then check out our Google Work From Home page as well for 9 ways you can work from home with Google. Finding a job where you can work from home isn’t difficult nowadays thanks to the Internet and all of the resources that it provides. All you need to know are your skill sets and qualifications and see if you find any online job postings that fit. Google is known to offer some amazing work at home job opportunities and applying to be a Google Field Service Representative can come with some great perks and benefits! 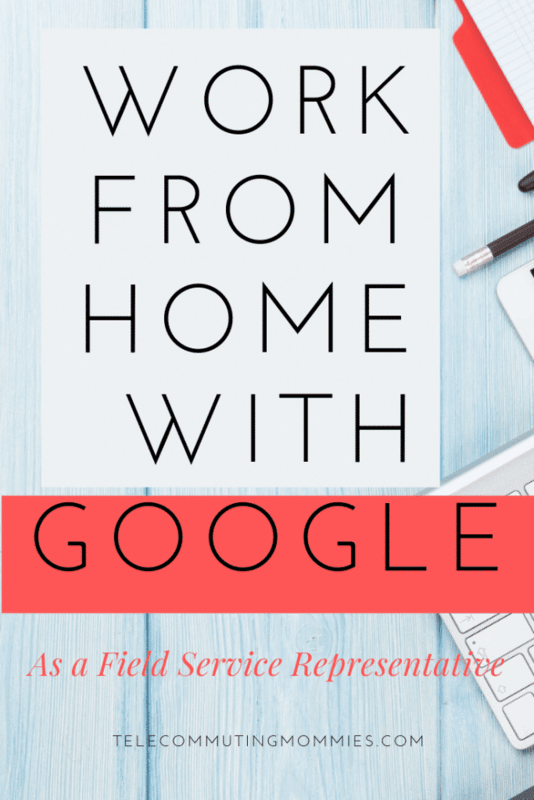 Being able to work from home as a Google Field Service Representative may be a good position for you! Working for an established company as big and as well known as Google has many benefits to consider. This work from home position is available only in certain areas including Houston or San Antonio, TX and Bentonville, AR. Here is more information on the position from the Google job site. “The Google Cloud Platform team helps customers transform and evolve their business through the use of Google’s global network, web-scale data centers and software infrastructure. As part of an entrepreneurial team in this rapidly growing business, you will help shape the future of businesses of all sizes use technology to connect with customers, employees and partners. As a Field Sales Representative, you’ll advocate for the Google Cloud Platform as enabling technology for business innovation. You’ll introduce Google Cloud Platform to our customers and accounts, drive awareness in the developer and startup community, and leverage and build the Google Cloud Platform partner ecosystem. You’ll also manage complex customer and stakeholder relationships. This position basically works to sell Google Cloud products to other businesses. Think of it like a liaison where you, the Field Service Representative, would assist customers with questions or trying to decide what Google product is best going to suit them and their needs. Customer service and phone calls are often quite heavy with a work from home position such as this. Strong Customer Service Skills- When the majority of your day is being spent talking to and assisting customers, you’ll want to make certain that you have strong customer service skills to be able to communicate and listen effectively. Good Work Ethic- Working from home isn’t for everyone…some people tend to have real motivational issues and trouble staying focused when it comes to trying to work out of their home office. Even though it’s an added benefit to working from home, setting a schedule and staying on top of it is key to your success. Solid communication skills- Trying to explain a product or a service over the phone to someone takes great communication skills. Since you’re not standing there in front of them, you have to rely on your ability to use your selling skills and analytic skills to understand exactly what they need or want to buy. Ability to build relationships with clients and customers-Part of this position is about interacting with customers so being able to build relationships and trust is a skill set that is much needed for this role. Experience in technical or sales engineering with Computer Science or Information Systems. Ability to build influential relationships and deliver results in a cross-functional/matrixed environment. Ability to effectively operate with flexibility in a fast-paced, constantly evolving team environment. Ability to speak credibly about platform and infrastructure-as-a-service and perform basic technical qualifications. Ability to plan, present, and execute on a territory strategy with excellent strategic and analytical skills. Keep in mind that when applying to a position with Google, they get thousands of applications each and every day so make certain that your resume stands out above the rest. Making your resume stand out from the other applicants doesn’t have to be hard! Make certain your name and contact info is bold, big and easy to read. Don’t make them search to find out how to contact you! Have your info at the top so they know how to get in touch and set up an interview. Highlight your strengths and tell them why they should hire you. Bullet point out why you’re awesome and let them know that they need you to join their team! Last but not least, don’t forget to follow up with them. If you are serious about getting a work from home job with Google, you need to be prepared to follow up with them to see the status of your application. That way, it shows them that you are interested in the position and it allows them to also hear your name to remember it more possibly than other applicants! Think this sounds like a good fit for your past work experience? Visit the Google careers page to find any current openings and apply. Remember these openings change frequently so check back often if there are not any showing available at this time. Type the term “field service representative” in the search box to find openings for this specific job. You can also visit our 9 Ways You Can Work From Home With Google post to find other options for making money from home with Google.